Is it OUTLAWS OF DRUNKEN GULCH? Oh, wait, I post that. Hint: The actress in the above pic appeared in an episode of STAR TREK. Come to think one of the actors might have as well. And that IS Wallace Beery Jr., right? Jim Rockford's dad from the series? Break out the root beer and hide your daughters JaseSF. . .
And that IS Wallace Beery Jr., right? maybe Wallace was Junior's dad - but NOAH Beery, Jr.'s mom has got some 'plainin' to do. Here's the next photo. Suspect this one shouldn't be too hard. Fiend without a face ??? I don't know, I'm just guessing. Wallace, Noah, who cares? They have "beer" in their last name. That's worth something. Do you honestly think I got to be this age with ALL of my brains intact? Silly, silly person you are. Oh my Gawd!!! Is that blond guy a member of The Illuminati? Well the blonde guy is the star of the movie. Hint # 1: The movie is a remake. Not Donovan's Brain but you're certainly on the right track. Hint # 2: the movie was filmed in the UK and West Germany. Cthulhu, you are correct. 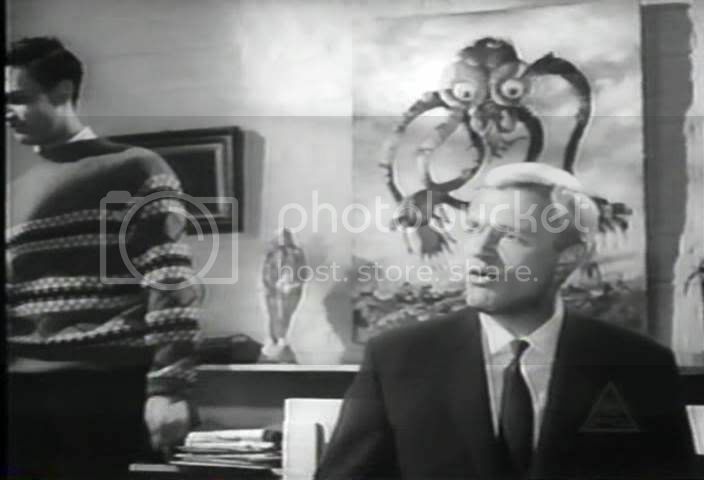 THE BRAIN (1962) starring Peter van Eyck was a remake of DONOVAN'S BRAIN.